This oats idli recipe by Shilpa Shetty Kundra is yummy and healthy! Bollywood diva Shilpa Shetty Kundra is the epitome of fitness. Known for being uber health conscious, Shilpa has her own collection of yoga DVDs and nutrition books. Often, she makes it a point to talk about yoga asanas and their benefits, healthy eating, recipes and general gyaan on healthy living. Recently, Shilpa shared one of her favourite recipes –oats idli—on her Instagram. Being a South Indian, she explained how her love for idlis comes naturally to her. This recipe, she says, is an even more nutritious take on the delicious idli. Idlis are usually made of rice flour or idli rawa flour. They are steamed and are hence healthier than a lot of other breakfast or snack items which are fried. The best part about idlis is that they can be customized the way you want. You could add various dals, seeds, spices and herbs to the batter to make it tastier and healthier. This oats idli recipe by Shilpa is made with oats flour. Oats is excellent for your heart because they have soluble fibre that helps lower bad cholesterol. The fibre in them also helps regulate your bowel movements and keeps digestive issues like constipation away. Oats are also good for bringing down high blood pressure. In a bowl, combine oats flour with rawa, carrots, coriander, turmeric, green chillies, salt. Mix it together. Add water to this mixture to bind it together. Make sure that the consistency is correct — not too thin or thick. Let the batter rest for 20 minutes. The semolina will absorb most of the water. For the tempering, in a tempering spoon, heat oil. Add the mustard seeds. Once they start crackling, add urad dal, chana dal and the curry leaves. Chopped curry leaves will make any dish tastier. Add the crackling tempering to the batter and mix properly. Keep aside. Now, grease an idli tray with oil. Pour the batter in the idli moulds carefully. Keep the idli steamer on high flame and let it come to a boil. Let it boil for about 10 minutes. 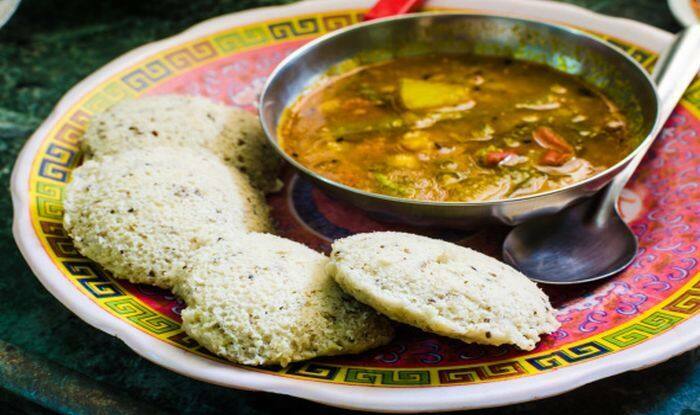 Scoop the idlis out and serve with sambar or chutney.